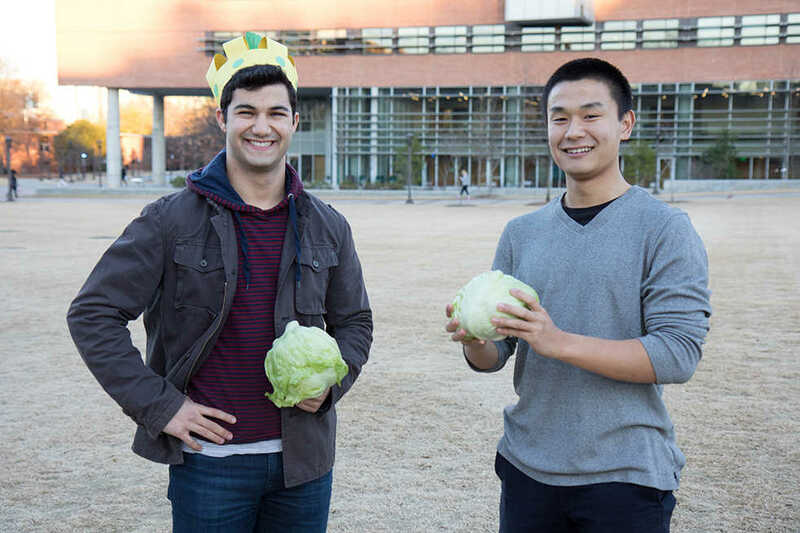 In the winter of 2016, Kevin Wang, third-year CompE, was bored and saw a head of lettuce. His solution: The Georgia Tech Lettuce Club. Wang, the organization’s current president, knew of similar clubs that existed at other schools and took the initiative to begin the tradition at Tech. “I don’t think anybody knows the origin of lettuce clubs,” said Wang. Although its history is vague, Tech students enthusiastically embraced the idea. The first annual meeting of the Lettuce Club this past semester was deemed a success. “I just bought a bunch of lettuce, a poster board and got some of my friends and a bunch of random people I forced fliers upon,” Wang explained. The rules of the club are simple: once a year, members gather on the Clough Turnaround Field and individually race to finish an entire head of iceberg lettuce. “Last year, we had over 30 people attend,” said Nick Rahaim, fourth-year ME. Finishing the race in first place last year with the time of 8 minutes and 29 seconds, Rahaim was announced the reigning Lettuce King. However, Wang expects the times to be much faster in the upcoming tournament. Though it may seem like a highly unusual pastime, Wang insisted that the peculiarity is exactly what draws the attention of so many Tech students. “Last year, a lot of participants said ‘We’re totally going to bring our friends next year.’ And it’s great that the club has a reputation already,” Wang said. Wang admitted that not everyone on campus supports the club or are as enamored with the competition as its members. Every Tech student is familiar with the stresses of college life. It is often very difficult to strike a balance between focus and fun, which is why the Lettuce Club has found the perfect niche here on campus. With virtually no time commitment or financial obligations, the club offers a great outlet for students who just want to have fun and make friends in a collaborative, competitive environment. “It’s totally a stress reliever,” Rahaim said. While the rules do allow for the use of condiments and ranch dressing is provided, Rahaim had strong opinions about eating the lettuce plain. The club also welcomes those who are less competitively inclined; attendees are not required to finish the lettuce or to participate. Many people go as spectators to cheer on their friends. Those who do compete also continue even after a winner becomes apparent. “80 to 90 percent of people do finish the race, even if it takes them longer. It becomes a personal goal and you feel the camaraderie; most of all it’s a fun time and a good atmosphere,” said Rahaim. “I think my favorite aspect is that you can see everyone struggling together. It’s like when you spend a late night at the CULC, and it is nice to see other people. Everyone is motivating each other to finish the race,” shared Wang. “That’s pretty accurate,” confirmed Wang. Though meetings aren’t very often (only once every year), at its heart, the club is an amalgamation of lighthearted fun and competitive catharsis. There may not seem to be much to the Lettuce Club, which could be where some of its criticism stems, but those who attend truly have fun. “It’s enjoyable to see other people laugh at you as well, everybody is happy and everybody is loving it,” said Wang. The second annual meeting of the Georgia Tech Lettuce Club is March 12th on the CULC Turnaround Field.